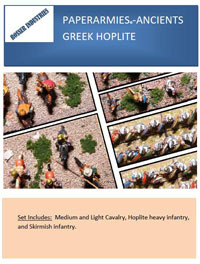 A set of two PDF sheets provides you with full color top down views of Cavalry, Hoplites and Skirmishers. A simpler army then many presented in the PAPER ARMIES groups, the heavy infantry Hoplites can also serve as Heavy spear armed troops throughout Greece, S. Italy, Sicily, Spain, N. Africa, and the Black Sea areas. Greek colonies spread throughout the ancient classical world, and hoplite type troops were used everywhere.